People to people relations between Nepal and India continue unabated since time immemorial. No other two countries of the world are as much bound together as these countries in social, cultural, religious, economic and even political fields. To a larger extent, the ties between the two countries are based on the foundation shaped by the unique marriage relationships between Goddess Sita and Lord Ram in Janakpur during the Ramayana period, some ten thousand years ago. As it is well known, Janakpur, the birthplace of Goddess Sita was the capital of Mithila; while Ayodhya, the birthplace of Lord Ram was the capital of Awadh. Ever since, both Janakpur and Ayodhya have emerged as the leading spiritual centres in this part of the world. As such, each year hundreds of thousands of devotees from Nepal, India and different other parts of the world visit these two places as pilgrims. In fact, Janakpur and Ayodhya happen to be as holy for the Hindus as Lumbini and Bodh Gaya are for the Buddhists, Jerusalem is for the Christians and Mecca and Media are for the Muslims. And yet, regrettably, no significant efforts have ever been made for the development of Janakpur and Ayodhya. Janakpur remained as much neglected in Nepal as Ayodhya in India. No government in Nepal and India ever remained serious about the development of these two spiritual centres, though their role in fostering amicable relations between Nepal and India has been unparalleled. However, in the modern history of Janakpur and Ayodhya, a breakthrough was made in the relations between these two most sacred places when Queen Vrisha Bhanu of Tikamgarh in India constructed world renowned Janaki Temple in Janakpur in 1910 AD Around the same period she also constructed Ram Temple in Ayodhya, which is also called Kanak Bhawan. Because of its general neglect for centuries, the holy city of Janakpur, with a population of 169,287 (2015), is hard pressed by a range of civic problems ranging from mosquitoes, absence of proper drainage system, mismanagement in garbage collection and its disposal, absence of landfill sites, pathetic hygienic environment etc. in the city generally and at the historic Janaki Temple. The temples and ponds which reflect the spiritual environment of Janakpur are badly encroached. The ponds, in general, are heavily polluted. Problems get compounded by extended periods of load-shedding. Janakpur Railway, the only railway line in Nepal that connected Janakpur with the bordering Indian town of Jaynagar, has not yet been made operational. Not much effort has been made to convert Janakpur Airport into an international airport. These have adversely affected the local economy and also pose immense inconvenience to the thousands of pilgrims coming to the city from far and wide. Recently, the Asian Development Bank (ADB) under its Integrated Urban Development Project (IUDP), has started work at Janakpur under a two billion rupees plan for the development of infrastructure including construction of roads, drainage and solid waste management. Additionally, community development programme is also part and parcel of this project. However, the common people of Janakpur are not satisfied with the pace and quality of work. Indian Prime Minister Narendra Modi visualised the role of Janakpur and Ayodhya in strengthening the traditional ties between Nepal and India. During his second visit to Nepal, on November 25, 2014, a landmark agreement was signed between the two countries for the development of Janakpur and Ayodhya as twin cities. This generated a new hope as it did not merely represent the aspirations of any particular individual or society, but that of over a billion plus Hindus at the global level. Echoing this sentiment, Nitin Gadkari, India’s Minister of Road Transport and Highways announced the construction of “Ram Janaki Marg” to link Janakpur and Ayodhya for which the government of India allocated IRs. 2,000 crore. Janakpur and Ayodhya municipalities were expected to form committees, appoint nodal officers, seek people’s participation and mobilize funds from domestic and foreign sources for launching developmental activities relating to infrastructure, environment, shelter, education, culture, sports, water treatment, solid management, public health, science and technology, urban and regional planning, tourism and heritage management. Additionally, the agreement has made provision for the exchange of delegations and promotion of interaction at the institutional level between Janakpur and Ayodhya. To enable the Janakpur and Ayodhya municipalities in carrying out needed work, both the governments of Nepal and India were asked to hold regular meetings, form ‘Joint Action Plan’ and mobilize necessary ‘financial resources’ for the execution of the projects. The two governments were also expected to undertake a joint initiative to develop modalities for collaboration with other international cities. The twin city agreement that was signed three years ago, was to end on November 24, 2017, unless renewed. Regrettably, over the last three years, no visible progress has been made towards fulfillment of the vision of establishing a vibrant twin-city arrangement. It was during the Islamic and British rules in India that the foreign rulers had tried to destroy the glorious spiritual values of Janakpur and Ayodhya. History stands testimony to the fact that during the Mughal rule in India, temples at Janakpur had been targeted in the same way as they had been targeted in Ayodhya. The case of Ram Janmbhoomi, the birthplace of Lord Ram is its clear evidence. Ever since then there was lack of initiative from both sides to develop the roads and other infrastructural facilities along the 622-km stretch between Janakpur and Ayodhya. In course of time, people even forgot about the trace of the trail through which Lord Ram and Maharishi Vishwamitra came to Janakpur during the Sita swayambar (marriage) and the trail through which they returned to Ayodhya after the swayambar. Yet, a new beginning was made Sur Kishor Das and Chaturbhuj Giri, the two spiritually enlightened souls, took a major initiative to revive the glorious tradition of pooja of Goddess Sita and Lord Ram in Janakpur in 1657 exactly on the same site where the present-day Janaki Mandir exists. Since then, the pace of modernization of Janakpur began. Credit in the recent time might be given to Indian scholar Ram Avatar Sharma who took a major initiative to reinvent the trails based on Ramayanic scripture through which Goddess Sita and Lord Ram travelled between Janakpur and Ayodhya. Mention of some of the important places where they stayed in course of their journey along such trails is made in his publication in Hindi ‘Jahan Jahan Ram Charan Chali Jahin’, published by Sri Ram Sanskritik Shodh Sansthan Nyas. 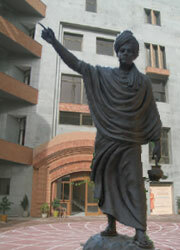 Previously, noted Indian scholar Sachchidanand Hirananda Vatsyayan ‘Agyen,’ popularly called ‘Agyen’ had made a meticulous contribution in this area. The twin city agreement will be more meaningful if connectivity between Janakpur and Ayodhya is also developed through the railways, airways and optical fibre, apart from the roads. Towards this end, the bus service could also be resumed between Janakpur and Ayodhya on a weekly, if not on the daily basis, in the beginning. It is argued that if bus connectivity can be introduced between Kathmandu and New Delhi, apart from some other cities of the two countries, there is no reason why direct bus service cannot be resumed between Janakpur and Ayodhya via the trails through which Goddess Sita and Lord Ram travelled. It is most likely that most of the Hindus will like to travel between the two holy cities through this road called Ram Janaki Marg as announced by Minister Nitin Gadkari. Subsequently, Nepal and India could also work on Janakpur-Sitamarhi track that will cut short time and distance between Janakpur and Ayodhya. Such an initiative would help Sitamarhi emerge as a major pilgrimage destination for the Nepalese and Indian tourists. Significantly, Goddess Sita had appeared at Sitamarhi when King Siradhawj Janak was tilling the land. As the broad-gauge railway line between Janakpur and Jaynagar is likely to be completed in the next few months, the two governments could also to introduce direct rail service between the twin cities (Janakpur and Ayodhya). There is also a strong case for developing air connectivity between the two cities by constructing a new airport at Ayodhya and upgrading the facilities at Janakpur airport. It is important that Ashrams, inns, hotels, and lodges are built with modern amenities to cater to the needs of the pilgrims and tourists of various income brackets. Other important aspects of the twin-city project could be establishment of communication connectivity, opening radio/TV channels at both the ends, broadband/optical fibre connectivity etc. Poverty in Janakpur-Ayodhya regions is more likely to be reduced with the development of infrastructural and communication facilities. A number of tirthatan (tourist) hubs are likely to grow on the 622-km stretch of road between Janakpur and Ayodhya. Such activities are likely to change the poverty-stricken and fragile zone between Janakpur and Ayodhya into economically most prosperous regions. Janakpur-Ayodhya relations are pivotal for reviving the strong cultural and civilizational links between Nepal and India. As such, the twin city development agreement should not be allowed to lapse due to the lack of political will and passive attitude of both governments. Against this backdrop, it is necessary for the newly elected Mayors of Janakpur and Ayodhya to take fresh initiatives to see that the agreement on the twin city development is renewed and work on different activities are launched effectively and completed within the given timeframe. The ADB supported projects should be integrated with the twin city concept and implemented without any further delay. With growing all round connectivity between the two cities, prospects of growth of agriculture, industrial, trade and service sectors, will increase and millions of people in the region will get employment opportunities which would finally raise their standard of living of the people. Such activities would not only link the two cities and boost up local economies but it would also strengthen the unique ties between Nepal and India further.